Reveal secrets hidden beneath the sand. 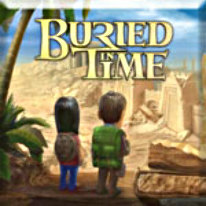 Hundreds of years later Bingham and Jack, two young archaeologists, arrive in search of the precious stone and the secrets behind a city’s great demise. Reveal ancient artifacts and relics exposing a passionate story of love and betrayal. Manage an archaeological dig as you build a team and keep them motivated by earning grants, collecting rare flowers, upgrading your camp, and cultivating relationships. Beware of those who appear dishonest, for only the pure of heart will prevail!